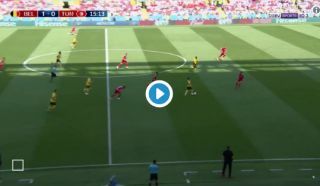 Romelu Lukaku has scored his third goal in two games for Belgium at this summer’s World Cup, and here’s the latest effort from Manchester United’s striker. The Red Devils star showed great movement as Dries Mertens played him in to strike home with ease to make it 2-0. Tunisia have since pulled one back, but with Belgium playing like this you wouldn’t bet against Lukaku getting another today. It’s worth noting as well that Mertens and Lukaku have combined superbly in this game, with United fans now dreaming of the pair combining up front together at Old Trafford. GOAL ?? @RomeluLukaku9 bags another #WorldCup goal and #BEL are looking fearless! José needs to get Mertens, him and Lukaku combine so well ? ?